According to industrial safety law, areas subject to hazardous noise must be clearly defined, and workers notified of the danger. In many cases, the noise hazard is intermittent and that's precisely the situation for which the GA902 was designed. 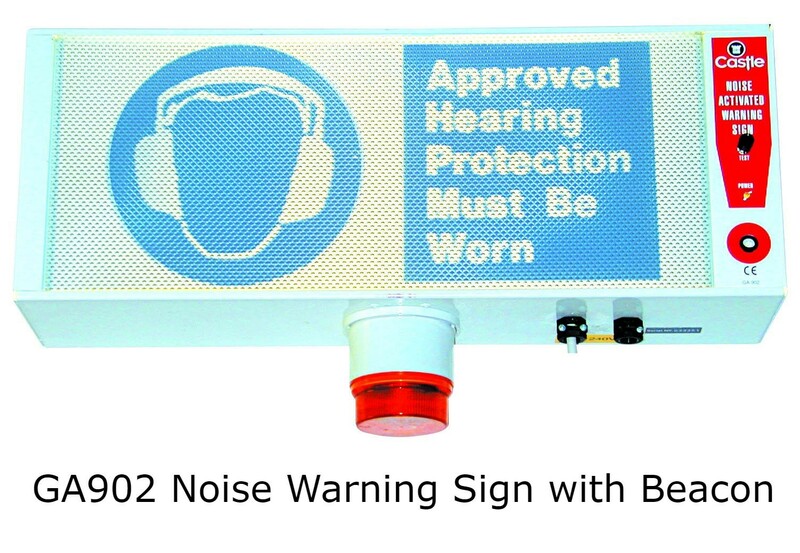 GA902 Noise Activated Warning Sign Rental - Hire it Today! According to industrial safety law, areas subject to hazardous noise must be clearly defined, and workers notifies of the danger. In many cases, the noise hazard is intermittent and that's precisely the situation for which the GA902 was designed. The GA902 activates only when the noise exceeds a pre-set level allowing exposed workers to wear ear defenders - often a less than popular safety measure - only when absolutely necessary. Being of rugged construction, the GA902 is suitable for most industrial situations. It is also available in Stainless Steel for the food and pharmaceutical industry. Warning text is generally supplied to EC requirements, but alternative graphic and languages are available to order. An optional remote microphone enables the sign itself to be in a prominent position while the microphone can be placed closer to a major noise source, order as GA902R. Fitting the optional Remote-Beacon greatly increases the warning impact, especially in large area. The GA902 is a self-contained unit housing its electronics in a tough case, and is easily installed and set for action. The front panel text is available as standard in EC or USA forms, but can be ordered in any language and a variety of colours. The front panel is completely blank when idle but brilliantly lit when activated to give an easily noticed warning. Outputs from the master unit can also trigger other external devices such as machines or process cut-off actuators - a complete system.